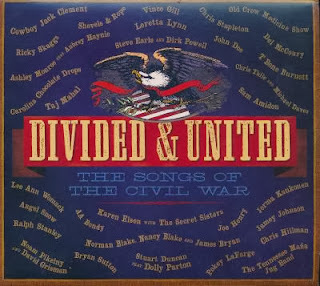 I've been listening to Divided & United: The Songs of the Civil War , a thirty-two track CD set of songs popular during the American Civil War sung by contemporary artists who, although preserving the original tunes, often give distinctively modern renditions. This is not an effort to re-create the sound of that time. Many of the singers are well-known country performers like Del McCoury, Ricky Skaggs and Ralph Stanley, but also people like Taj Mahal, T-Bone Burnett, Chris Hillman, Steve Earle, and Jack Clement, along with groups I don't know like the Old Crow Medicine Show, the Carolina Chocolate Drops and the Tennessee Mafia Jug Band. It's all good. With its lilting melodic hook and melancholy story line, "Listen to the Mockingbird," an 1855 lament sung by a grieving widower for his lost love, sounded "as sincere as the laughter of a little girl at play," said Abraham Lincoln. The album mixes new takes on old tunes like "Dixie" (by Karen Elson and the Secret Sisters) and "When Johnny Comes Marching Home" (Angel Snow) with a raucous partisan Yankee stomp like Shovels & Rope's "The Fall of Charleston" and the rebel reel "Secesh" (The Tennessee Mafia Jug Band)—songs that have been in mothballs since Appomattox. Some tunes sound like after-action reports telegraphed from the front. Among them are T Bone Burnett's dirge, "The Battle of Antietam," and Ricky Skaggs' "Two Soldiers," about Union soldiers caught in the deadly fire from the heights at Fredericksburg in 1862. 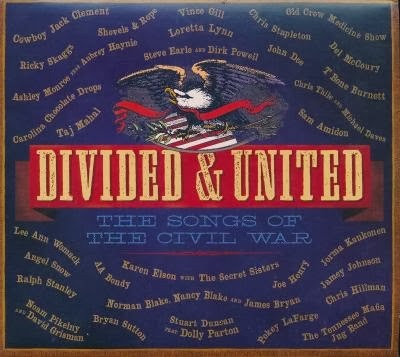 WSJ - Civil War Pop Music: "Divided & United"